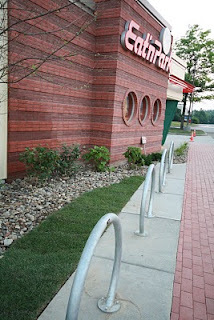 On July 9, 2010, Team Smiley attended Cranberry Community Days to celebrate a very special event – the unveiling of Smiley Cookie Lane! 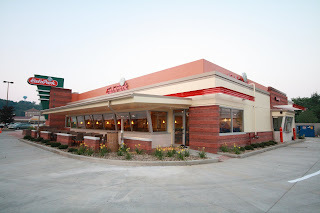 Eat'n Park purchased the naming rights to Smiley Cookie Lane several years ago as a fundraiser for one of the area's local civic groups. This new street will be located in an upcoming housing development in Cranberry Township. Construction on this development has recently begun, so Smiley and his crew have begun celebrating! Team Smiley gave out about 900 Smiley cookies to the attendees of this special event. 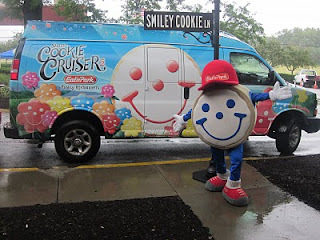 Smiley even came out and braved the stormy weather – he did not want to miss out on such an exciting event! Smiley poses in front of his namesake street sign! Allow us to introduce you to the latest and greatest from our always-fantastic lineup of mouthwatering desserts…..our new Strawberry Crème Pie! Of course, our original Strawberry Pie could never be topped – after all, it’s been around for 56 years for good reason! No, our Strawberry Crème Pie isn’t a replacement for the original; it’s more like a great sequel. Think The Godfather, Part II. Yes, we just compared this pie to perhaps the greatest sequel of all time. It’s that good. Loaded with fresh sliced strawberries suspended in crème, and topped with whipped cream and strawberry drizzle, this is one offer you can’t refuse! Stop in soon though, because it’s only available in July. Strawberry Crème Pie, just $2.69 per slice! 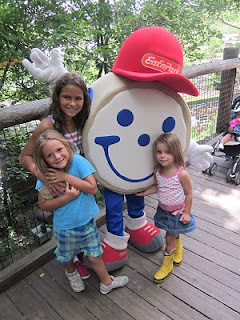 Team Smiley Kicks Off Eat'n Park Family Week at the Pittsburgh Zoo! Lions, Tigers, Bears…and SMILEY! 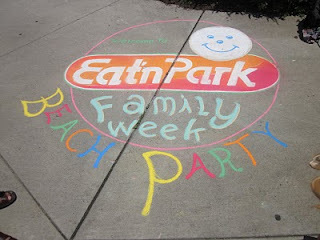 Eat’n Park kicked off Family Week at the Pittsburgh Zoo and PPG Aquarium on Saturday, July 10th. It’s sure to be a week filled with fun for everyone! On Saturday, Pittsburgh’s own Sarah Marince (who just happens to sing the Eat’n Park jingle) gave a concert from the roof of a building in the Zoo. Kids, families, and Smiley had a blast dancing to the music. After the concert, we followed Smiley over to Kid’s Kingdom, where he got to hang out with the kids who were enjoying all of the Kingdom’s fun activities, including a giant new sand pit full of beach balls and toys. At the end of the day, we passed out Smiley Cookies to visitors as they were leaving the Zoo. It was a sweet finish to a fun day! The very next morning, we packed the Cookie Cruiser full of Smiley Cookies and made our way back to the Zoo for Shark Day. We spent most of the day at the Water's Edge exhibit in the underground viewing tunnels near the Zoo's fiercest sharks. The sharks came right up to the glass, but that didn't scare Smiley or his adoring fans! After our close encounter, we headed back to the Cookie Cruiser so that kids could decorate their own awesome Smiley Cookies. We were amazed at the creativity we saw! It was heartwarming to see so many families spend a day together and share some great moments at the Pittsburgh Zoo and PPG Aquarium. We had a fantastic weekend at the zoo, and we’d like to thank everyone who came out and made our visits so fun! Don't forget to stop by the zoo to enjoy the rest of Family Week. 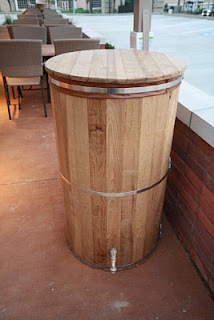 Click here to see all of the other Family Week activities! 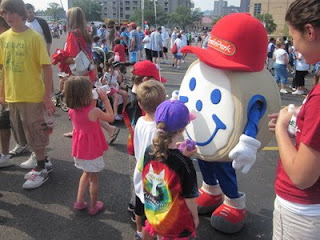 On Saturday, June 26, Team Smiley attended the 2010 Pittsburgh Walk Now for Autism Speaks. Held at the Mellon Arena for the first time ever, participants walked through the streets of Pittsburgh around the arena. The event kicked off at 10:00 am, with over 12,000 attendees sporting personalized t-shirts that showed off the individual they were supporting. Team Smiley had an unforgettable time at this family-friendly event! At Team Smiley’s Eat’n Park booth, participants had the opportunity to decorate their own cookie or enjoy a free Smiley cookie before the walk started. We met hundreds of amazing families and children, as they shared with us wonderful stories about who they were there to support. Smiley himself made an appearance, welcoming the participants and posing for pictures with smiling guests. With over $450,000 raised, we felt privileged to be a part of Walk Now for Autism Speaks. It was a fun, memorable event for the whole team. Thank you and congratulations to all of those who participated! You truly make a difference! 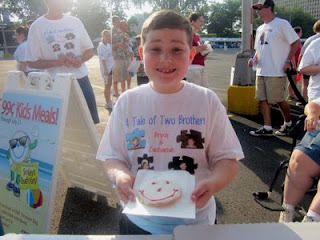 A young walker shows off the Smiley Cookie he decorated!